HOLLOW Sample Page #3–FINAL ONE! Here is the third and final sample page from my graphic novel, Hollow, release date set on Oct 1st! 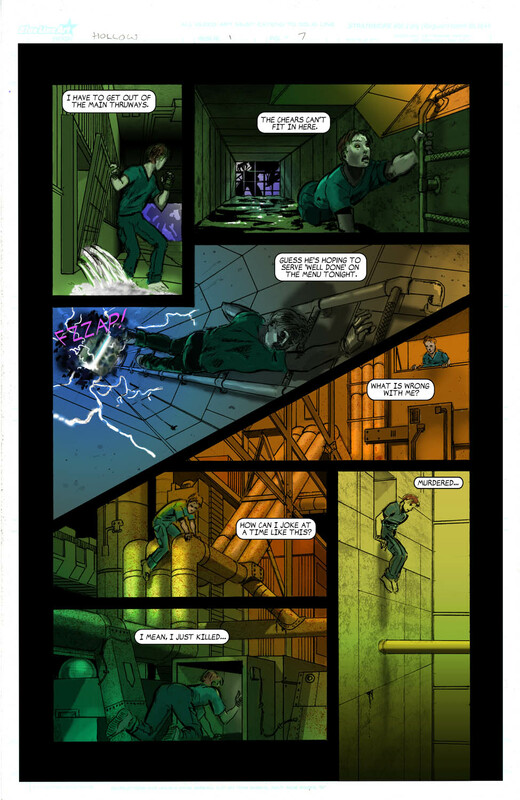 Below is page 7, where Noz is on the run from a Chear patrol guard, and trying to come to grips with what he has just done…. Next week there will be a special reveal from up and coming author, Jessica Therrien, who came out with her debut novel, Oppression, this past March. The cover for her second book in this YA series, Uprising, will be revealed on my website next Wednesday, the 22nd. I am so pleased to be a part of supporting Jessica with her Children of the Gods series. Check out my post from March about her first book or look her up at www.jessica-therrien.blogspot.com. Love the colors transitioning in the background. So excited for this book! « HOLLOW Sample Page #2!